When Katie & Rob started planning their wedding at Geneva Point Center, they knew they had found a place their guests would love. The camp gave them the flexibility to plan a morning ceremony and then spend the afternoon playing games, rowing on the lake, or wandering around the campus. They could also plan a more formal evening reception to please the traditionalists and their many friends who wanted to dance all night. And one of the best things about this particular destination wedding is that it was affordable - bunks went for $20 a night, and private rooms for $100 a night. There was even a camping option for a mere $12 a night. And instead of a typical 4-hour wedding, guests enjoyed a whole weekend of fun. Katie & Rob had the genius idea of inviting their friends over for two separate events: a Champagne-Tasting Party, and a Cake-Tasting Party. This is the kind of wedding help people can get behind! For the results of the champagne tasting, click here. The cakes they decided to go with (rather than one big expensive cake) were: four tiramisu cakes from Stop & Shop; two cheesecakes from Hart Turkey Farm; and four flourless chocolate tortes that Katie made herself, the night before the wedding. Join us on Monday for the recipe she swears by. On one of their first visits to the camp, they ran into a staff member who mentioned that the camp is really in need of man power - a property that large takes a lot of time and energy to maintain. Katie & Rob looked at each other and immediately offered to volunteer. They went back on several weekends to help out - even helping to clean the chapel for another wedding. Katie says, "The people are so nice!" and the couple plans to volunteer there each spring. They also had nothing but great things to say about their event coordinator, Natalie. "She was welcoming and fantastic!" and they loved that she was there Friday night, line dancing along with everyone else. Most of the guests arrived the night before the wedding for a barbecue and party in Geneva Point's rustic barn. September nights get pretty chilly in New Hampshire, so they had a roaring fire in the stone fireplace, and ingredients for s'mores. Best of all, they hired a bluegrass band. Rob wasn't sure if people would actually dance, but then his mother stepped up and started calling square dances, and before they knew it, people were swinging their partners like pros. Rob loved seeing his mom in her element. This was a Geneva Point innovation. Brilliant! They filled the canoe with beer brought by the couple and refreshed the ice a couple times a day. 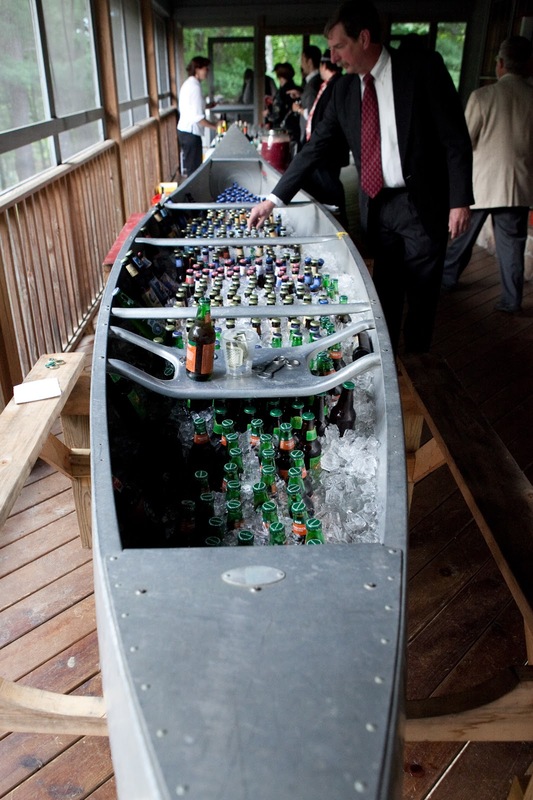 Guests could wander over to the beer canoe day or night all weekend, and the camp was kind enough to transport it from the playing fields to the deck of the reception. 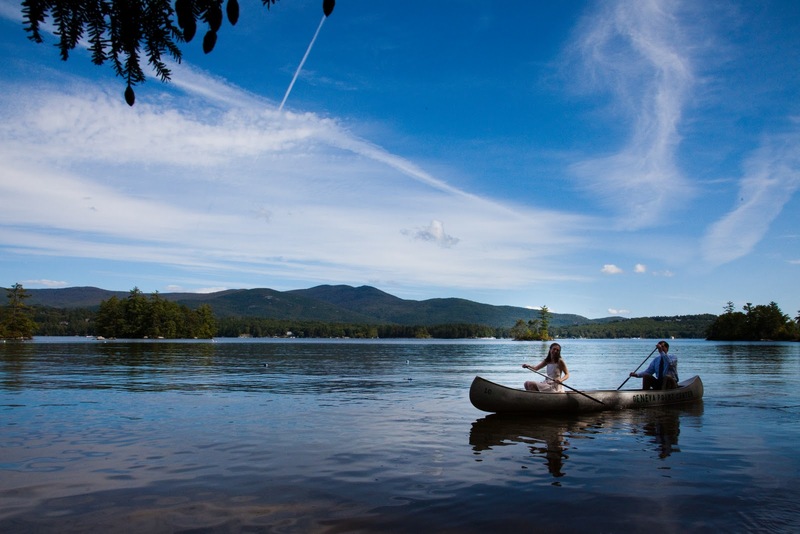 Katie's father escorted her to the ceremony by canoe. Katie said she knew there'd be less chance for her to cry than there would be if she walked down the aisle - and she loved watching a crowd form on the bank as people realized what was happening. It was a memorable entrance! Not only did Katie & Rob plan an untraditional ceremony, they asked their friends and loved ones to take on special roles. Their officiant was a friend of theirs, Kristopher Moreau, who was certified to officiate online. Rob's father played all the incidental music on piano. Katie's aunt performed a ceremonial hand-binding. All four of their parents were publicly asked to give their blessing. And there wasn't a dry eye in the house when Rob's grandfather and Katie's grandmother each spoke a few words about what made their long marriages last. Katie knew her mother would do a brilliant job with the flowers. She chose to carry a bouquet of dried flowers that could be made ahead of time, and the night before she and her mom put together centerpieces of fresh flowers. Amazing bonus: Rob's aunt and uncle run an Agway, and the morning of the wedding they called them up to see if they'd like them to load up their truck with all the display models of mums. OF COURSE they would. These flowerpots were artfully placed around the ceremony site, and loaded back up at the end of the weekend. Katie & Rob worked with the camp to provide all kinds of games - bocce, badminton, frisbee, croquet, soccer - but the most memorable event was the Taylor vs. Guptill tug-of-war that kicked off the afternoon festivities. There was a lot of trash talking and the placing of friendly bets. In the end the Taylors slid their way to defeat, but they were good sports about it - even Katie in her bridal sundress. Rob's mother loves to dance, but his father, not so much. So Rob was surprised and thrilled to see his dad willingly out on the floor. Rob said he was in such a good mood, he actually felt like dancing! No coercion necessary! And they weren't the only ones. The dance floor was packed with their friends until all hours, dancing to the great playlist that Rob spent ages putting together. After the reception all the guests who weren't exhausted headed to a bonfire the camp had set up. Katie & Rob were looking forward to relaxing around the fire with everyone - but first, they were starving. So they raided the fridge in the reception hall basement and stuffed their faces. It was practically their first moment alone and Katie remembers turning to Rob and saying something she had thought repeatedly all day: "All of this happiness, is for us! Truly awesome tips on arranging the wedding. Last week, I arranged my cousin’s ring ceremony at one of grand venues in Atlanta. Arranged a dinner party by hiring a party caterer. We all had amazing and fun time together.